Purell Advanced Hand Sanitizer is enhanced with aloe and four different skin conditioning agents to help maintain skin health and moisture and improve overall skin feel. 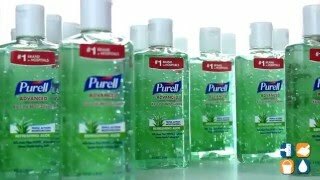 America's #1 instant hand sanitizer, Purell kills more than 99.99% of that most common germs that may cause illness. Specially formulated with moisturizers, hand will feel soft and never sticky, even after repeated use. Best of all, it works in as little as 15 seconds with no water or towels necessary. These 4-oz. flip cap bottles are the perfect size for desks and counter tops but will also fit easily into purses, backpacks and diaper bags for on-the-go hand sanitizing. Stock up today and save!